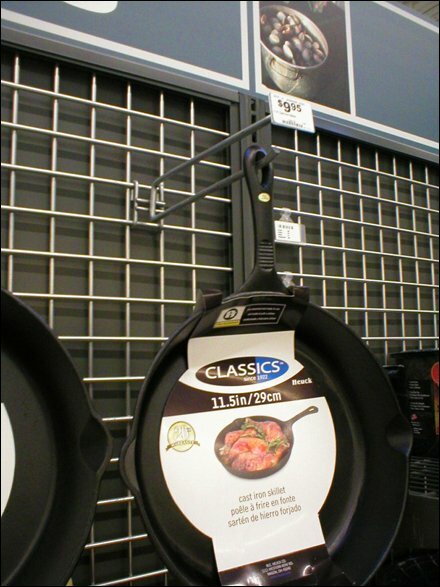 Wire Grid provides a very interesting dimensional backdrop including drop shadow for this cookware. A simple All Wire Grid Hook with metal plate label holder plays a supporting role. I suspect an all wire hook was chosen for its minimal profile, so as not to shout its presence and distract the eye from the merchandise. Grid and hook set a nice stage for the product, with Hanging Label Holders directly on the grid as back tags. If the display were to remain this lightly stocked I would recommend Inventory Control Clips or Shams to keep items neat, forwarded and in correct position. SEARCH “Cookware” for other staging ideas for these items.